Calvin Robertson Griffith (December 1, 1911 – October 20, 1999), born Calvin Griffith Robertson in Montreal, Quebec, Canada, was a Major League Baseball team owner. As president, majority owner and de facto general manager of the Washington Senators/Minnesota Twins franchise of the American League from 1955–1984, he was famous for his devotion to the game and for his sayings. 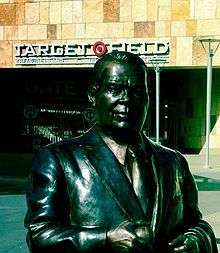 A bronze statue of Griffith outside Target Field in Minneapolis. The son of a minor league baseball player, Calvin Robertson was the nephew of Clark Griffith, the Hall of Fame former pitcher and manager who became president of the Senators in 1920. He raised Calvin from the age of 11, but did not adopt him when Calvin's father died a year later. Calvin's widowed mother and his siblings moved to Washington as well, and at least three brothers — Sherry, Jimmy and Billy Robertson — and a brother-in-law, Joe Haynes, would eventually become Senators' executives, while brother-in-law Joe Cronin, a Hall of Fame shortstop, would serve as playing manager of the Senators and Boston Red Sox, general manager of the Red Sox, and president of the American League. The senior Griffith owned the Senators until his death in 1955; upon his death, the team passed into the hands of Calvin, who had worked his way up through a variety of positions with the team, starting as a batboy, minor league player and manager (serving a brief stint under Joe Engel and the Chattanooga Lookouts at Engel Stadium), and front-office executive. Calvin and his sister, Thelma Griffith Haynes, each inherited half of their uncle's 52 percent stake in the Senators. However, for the next 29 years, Thelma voted her shares along with Calvin's, giving Calvin effective control of the team. "I'll tell you why we came to Minnesota. It was when we found out you only had 15,000 blacks here. Black people don't go to ballgames, but they'll fill up a rassling ring and put up such a chant it'll scare you to death. We came here because you've got good, hardworking white people here." In 1984, buffeted by the changes in baseball brought about by free agency, Griffith sold the Twins to Minneapolis banker Carl Pohlad, ending 65 years of Griffith family ownership. Griffith wept at the signing ceremony. He stayed on for a time as chairman of the board. Griffith died on October 20, 1999 at the age of 87. Ironically, he was buried back in Washington, D.C., a city he rarely visited after he moved the Senators to Minnesota, and as a result made him one of the most disliked figures in Washington sports. Calvin Griffith was inducted into the Canadian Baseball Hall of Fame in 2010. ↑ Deveaux, Tom (2001). The Washington Senators 1901-1971. McFarland & Company. p. 156. ISBN 0786409932. ↑ Coleman, Nick (October 1, 1978). "Griffith spares few targets in Waseca remarks". Star Tribune. Retrieved August 12, 2012.